It wasn’t the cushioned wooden lounge chair, the thick robe, the citrus-infused water or the soaking pool looking out on the rolling green countryside that truly spoke of relaxation. No, it was only when I discovered that all of the magazines were in Portuguese that I finally shut off my head and indulged in the unique sensory experiences offered by a French spa in the heart of Italian wine country in Southern Brazil. Villa Europa Hotel and Spa Do Vinho, just completed in 2007, is in a part of Brazil that surprises stereotypes. Serra Gaucha, in the state of Rio Grande do Sul, was settled by Italian immigrants in the late 1880s. The hills here are covered in grapevines managed by those families. It’s much more similar to Europe than to Rio de Janeiro—Europe on a budget, that is. The dollar does far better against the Brazilian real than the euro. In honor of the Italian culture in which the hotel is situated, directors Aldemir Dadalt and Deborah Villas-Bôas Dadalt furnished the lobby with antiques from area families; the rooms feature modern furniture with a nod to Italy and all things wine. And in honor of the vineyards that surround Villa Europa, the Dadalts created the fifth French Caudalíe spa in the world, employing grape products such as the seeds and stems in its vinotherapy treatments. The half-day invitation package (392 reales) is an introduction to the procedures. It includes a bath, a wrap, a facial, and a choice of scrub or massage. Of the four bath choices available, I selected the 20-minute Bain Barrique in what is essentially a jet tub outfitted to look like a wine barrel. The therapist added a shot glass of crushed extracts from the grape seed, stalk and pulp, said to have a mild exfoliating effect, and a spritz of “draining” essential oils that scented the water. Whatever the intended results, it certainly is relaxing sitting in the alternately hot and cool water and staring out at the blue sky and green hills long enough to clear every thought in one’s head. Afterward, I dragged my lazy self to the waiting area, an indoor pool surrounded by round stones and circled by wooden chaise lounges. A wall of windows was open to a sunny outdoor patio dotted with wooden rockers, and the warm indoor air was tempered by the cool breeze. I sipped citrus water and dozed, reassured that a therapist would track me down and check my schedule, which was put in a plastic sleeve and tucked into the pocket of my robe. It sidesteps the language barrier, which in turn boosts the relaxation factor—there’s no possibility of chit-chat. Next up was the massage. The list of options is a page long. I chose the hourlong Massage Vigneron, said to recreate the steps of the winemaking process. No one squashed me with their feet, but the therapist did use a rounded “winemaker stick,” applying pressure on my back with the end of it and rolling it up and down my legs. This whole-body massage with grapeseed and essential oils is supposed to activate the circulation and tone muscle to leave one bursting with energy. I failed miserably, still relaxed enough to feel foggy as I crawled off the bed and was helped into my cozy robe. The wrap that followed did wake me up. In the Envelopamento Énergie, a 20-minute treatment, a therapist glops a warm mixture of bentonite clay; crushed grapeseeds, pulp and stalks; and grapeseed oil all over one’s body, then wraps one like a messy burrito in first plastic, then heated blankets. After I had cooked long enough, the therapist returned to the dim room and helped me slip and slide into a shower. I rinsed off all the goo, but my skin still felt like silk. I ended with the Grand Soin Du Visage Caudalíe facial, the one-hour “cult Caudalíe treatment.” If this is a cult, I’ll drink the Kool-Aid. The technician cleaned every pore and massaged my hands and feet as well. I felt rested and radiant. The hotel itself offers plenty of diversions if you ever decide to leave the spa. There is a fitness center and, on weekends, a children’s recreation lounge and movies. An outdoor pool and hot tub offer amazing views from landscaped patios. There is a game room above the bar area, a gift shop and a library. All social areas offer free WiFi. The restaurant, Leopoldina, serves French-Italian specialties such as green salad with pear and proscuitto parma or partridge agnolotti with blueberry sauce. Room service is available as well, including a spa-like grilled fish with rice and vegetables, albeit in hazelnut butter. The minibar, however, offers a deadly array of chocolates, chips, wines and beer. Villa Europa has more than 550 different wines in its cellar and sells the VE Merlot, made by Miolo Winery across the road exclusively for their hotel. Even better, a concierge can help you rent a car or put you in touch with an agent to arrange an excursion. An estimated 150,000 people visited the Vale dos Vinhedos area in 2008. Most come to tour the more than 30 wineries there, which are generally open 9 a.m.-5 p.m. every day. Miolo is just down the hill from the hotel; Casa Valduga, Salton and other wineries in the region are a short drive and accommodate guests with tours and restaurants. Studios featuring the works of painters, cheese-makers (including the Italian pecorino) and other artisans line the winding roads. Bento Gonçalves is the nearest city, a wealthy enclave of 100,000 with hip clothing boutiques and a clean and quaint downtown. The major industry aside from wine here is furniture, so look for locally made examples. Of course, this still is Brazil, so along with your pasta and cappelletti soup you’ll find as much meat-from-a-spit as you can eat at churrascarias such as Castelo Benevenutti, between Bento Gonçalves and Garabaldi (giuseppe.com.br/en/index.htm). In fact, such excursions might necessitate a return to the spa for the Massage Sauvignon, “made of techniques that improve blood circulation of regions of the body where there’s fat accumulation, helping to reduce measures and fighting cellulites.” The spa notes that it only provides visible results if done regularly. I’d be happy to comply. You will need a visa in addition to your passport to visit Brazil. See the General Consulate of Brazil in Chicago’s website first at brazilconsulatechicago.org/en-0-0-0.html for their requirements. Follow the instructions precisely to gather the necessary documents and allow at least three weeks to a month to process the application. Both TAM and United Airlines fly direct from O’Hare to São Paulo. From there, TAM flies into Porto Alegre, the capitol of Rio Grande do Sul. Villa Europa can send a car to pick you up at the airport in Porto Alegre, which is approximately an hour and 45 minutes’ drive. They will transport as many as four guests at a time for 200 reales (per trip, not per person) each way. The standard rate for a basic room at Villa Europa is 510 reales; prices may be lower in the off-season or based on availability. RSVP by writing reservas@spadovinho.com.br, and someone will respond. The website, spadovinho.com.br, is changing right now to reflect Accor’s designation of the hotel as the ninth in its Gallery series. Spa appointments fill quickly on weekends during their busy months: December-March and July. (Our summer is their winter, and many Brazilians from the north travel to Serra Gaucha in July to experience snow.) 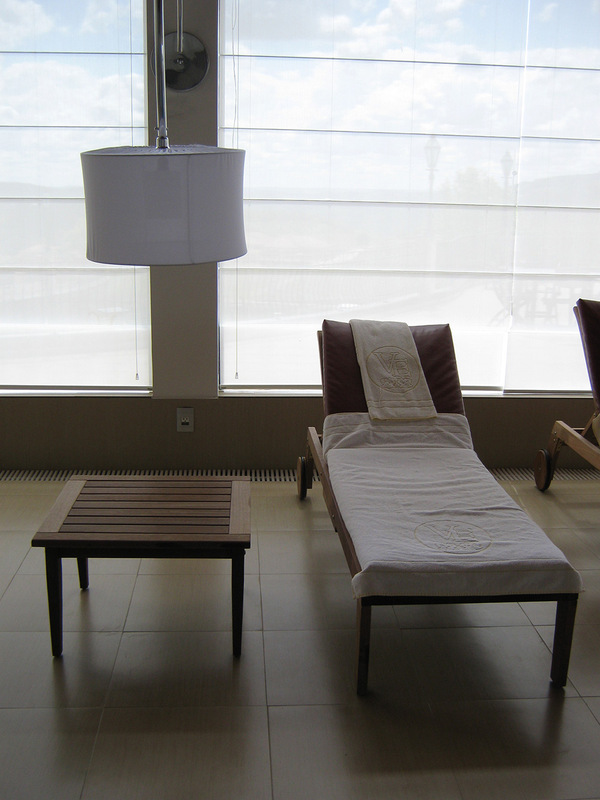 Schedule your spa treatments before you arrive or immediately upon arrival. Write spadovinho@spadovinho.com.br. You’ll typically find someone who can speak English at the tourist destinations, and there is always at least one English-speaking staffer on duty at the hotel. If you wish to investigate hiring a translator, contact Beatriz Glauche, director of the local language school Window Centro de Idiomas, at windowbg@italnet.com.br.